In a medium sauce pan bring butter and water to a boil, stirring until butter melts completely. Reduce heat to low, add flour and salt. Stir until mixture leaves side of pot. Remove from heat. Add eggs 1 at a time, beating after egg is added. Place mixture into a pastry bag with a large tip ( I used a #10 tip) pipe onto cookie sheet in 1-1/2×4 inch strips. Bake for 15 minutes at 450, lower temperature to 325 and bake for 20 minutes. Cool completely on wire racks. In a bowl combine pudding mix & milk according to pkg directions. In a separate bowl beat cream until soft peaks, beat in confectioners sugar and vanilla. Fold cream mixture into pudding. Place in piping bag and pipe into pastry. Heat cream on medium heat to a boil, pour over chopped chocolate in a separate bowl, stir until completely melted and mixed. Cool glaze for 10-15. Dip eclair’s into chocolate glaze. 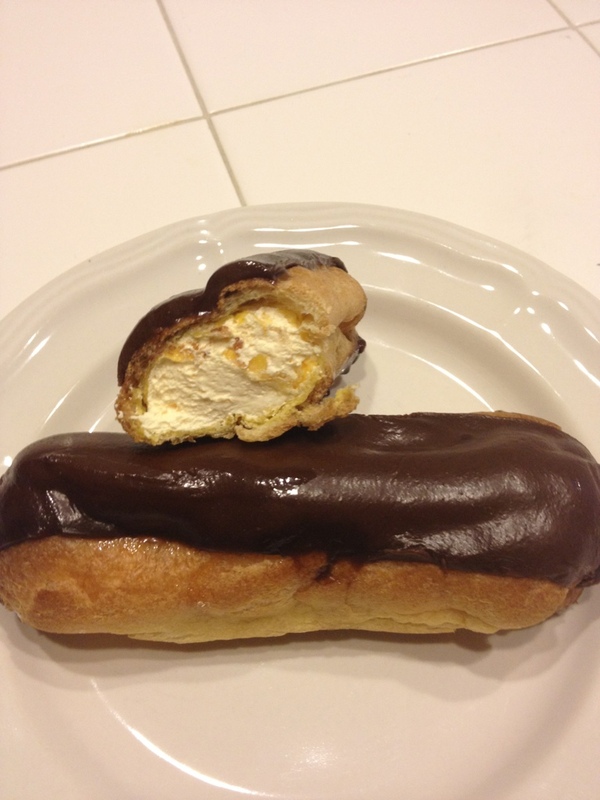 Place and store eclair’s in fridge! This is one of my childhood favorites!! Thank you so much for sharing them on Manic Monday!! !